You’ll be hard pressed to find a goofier Revolution game than the one that unfolded at the stadium colloquially called “the Stub” on Saturday. And the shenanigans didn’t even have the decency to wait until the opening whistle. It all started appropriately enough with the blonde-mohawked bandit himself, Saer Sene. Prior to the signal, referee Elias Bazakos seemed to take exception to the striker’s hosiery. It is unknown what objection Bazakos had to Sene’s socks, but it was strong enough to delay the first chirp, as well as the striker’s return to the field after he briefly went to the bench in the first half. Then, of course, is the Revolution starting XI itself. With Andrew Farrell unavailable, Jay Heaps went with everyone’s favorite utilityman, Ryan Guy, at right back. Predictably, the Chivas attack shifted focused the efforts along the left, where Guy did his best imitation of a first choice fullback and, it should be noted, with much enthusiasm. To his credit, he did well enough to avoid a potential #SCNotTop10 performance. More silliness ensued whenever Jose Goncalves crossed the halfway line and tried to play it to his wingers. With the Goats packing the rear, the Portuguese Pillar unleashed a few passes that caught the likes of Chris Tierney and Lee Nguyen by surprise. For those curious, that is what happens when you face a side that employs a nine-man backline. Speaking of Goncalves – Did you see the wide-eyed facial expression he flashed to Bazakos after Tristan Bowen pushed him in the 74th minute? Forget Deuce-face. Somebody ought to construct a larger-than-life cutout of JoGo-face for Saturday’s game against San Jose. Sometimes, the “no idea” explanation is as good as any. Except here at Five Things, where we try to gleam any insight we can whenever the Revolution step onto the pitch. 1. Juan Agudelo’s absence was impossible to ignore. You have to think that with the way Saturday’s game unfolded, Jay Heaps could only wish that Juan Agudelo had Wolverine-like healing powers. And it’s easy to see why. Even though the Goats practically mailed out invitations to mingle inside its defending third, the Revolution struggled mightily to muster quality chances with Agudelo on the self. The attack was predictable, stale and sleep-inducing for those of us on the east coast who didn’t have a bucket of coffee on hand. That’s not to say that Diego Fagundez, Lee Nguyen and Saer Sene weren’t trying. They were. They would’ve made a few all-effort teams this week. It was just that they were trying the same things over and over…and over. Had Agudelo been healthy and ready, he likely would’ve stretched the Goats’ defense, and provided a little more wiggle room for Fagundez to operate. Plus, his aerial abilities and hold up play probably would’ve given the Revolution a few stronger chances at Dan Kennedy. 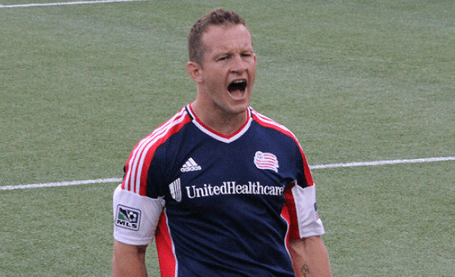 Agudelo may not be a mutant with superhuman healing powers, or an adamantium skeleton for that matter, but he probably would’ve saved the Revolution from relying upon Chad Barrett’s disheveled strike to salvage a point. 2. Yes, the Goats gave the Revolution a lot of real estate near the halfway line. But without Scott Caldwell or Kalifa Cisse in the middle of the park, the guests were unable to dissect and dismantle the defense. Bless Clyde Simms’ heart. Finally healthy after missing over a month due to injury, the veteran center half was called upon to serve as a facilitator – or at least something close to it – with Cisse hurt and Caldwell unable to start due to mid-week U.S. Open Cup action. What he did instead was what Clyde Simms does best: Backpass and freelance. We’ve long known that Simms is at his best when partnered with a strong presence in the middle. But without Cisse or Caldwell (who came on for the veteran center half just after the hour), Simms quickly disappeared, leaving Jose Goncalves and Stephen McCarthy to serve as de facto holding midfielders on the attack. The result: A slew of awkward passes, odd positioning along the wings, and general disarray. Without someone to scan and analyze on the fly, to act as a field general, there were too many times in which it seemed like it was every man for himself. 3. Let’s call it how it is: Lee Nguyen is struggling this season. There’s no doubt that the 26-year-0ld midfielder is a talented player. Last year, he provided the some much-needed creativity and unpredictability, something the new look Revolution desperately needed in year one of the Jay Heaps regime. This year, through 16 games, he’s tallied twice and grabbed an assist, which isn’t the worst statline for an attacking/wide midfielder. But on Saturday, a game in which three points were ripe for the picking, Nguyen wilted. Yes, it didn’t help that the Goats had essentially walled off the inside, where Nguyen tends to take it. But instead of making adjustments, Nguyen seemed to drop back and let others try to figure it out, as he’s done many times this season. Heaps, to his credit, has tried to shift Nguyen around the midfield, hoping to unlock the potential we saw last season. However, more often than not, it seems that when Nguyen loses his confidence, he shies away from the spotlight and appears all too content to track back and take on defensive responsibilities. This is an admirable quality for most, but it isn’t as admirable when your name is Lee Nguyen. 4. It took much, much too long for the Revolution to recognize the need to get wide with Chivas parking the bus. Another byproduct of Agudelo’s absence was the hesitation to switch things up on the attack. Since his Revolution debut, he and Fagundez have struck up a remarkable chemistry that’s done well enough to take the final ball off the endangered species list. But without the former Goat, Fagundez, Sene and even Bengtson were slow to recognize that cutting inside and trying to drive the stake into the heart of the 10-man Chivas defense wasn’t working. Eventually, they figured this out, and started to switch things up in the second half, where the chances finally started to arrive. But the fact that it took so long for them to make adjustments potentially cost the Revolution a first-half goal, and probably maximum points over Chivas USA and their blasphemous brand of soccer. 5. As much as three points would’ve been the ideal, one point isn’t as bad as it looks when you take into consideration the circumstances. At the end of Saturday’s broadcast, Brad Feldman asked Jeff Causey whether the 1-1 draw was a point that felt like a win, or a point that felt like a loss. Based upon the twitter feed of yours truly, it seemed like many subscribed to the latter. And, in some respects, it’s a justifiable sentiment. Chivas is last-place team that played like a last-place team, and the Revolution came within inches of giving them their first win since March. But it’s also worth remembering that in addition to Agudelo absence, Caldwell only had a half-hour on the pitch and Ryan Guy had to fill in at right back. Clearly, this wasn’t a team that was going to score five goals. Aside from the personnel, the amount of travel the team undertook leading up to Saturday probably didn’t help, either. Yes, Chivas is a beatable team, and in some respects, the Revolution should’ve mopped the floor with them. But in reality, the standings suggest that the Revolution are not a playoff-caliber club. In light of that, a point on the West Coast for a sixth-place club coming off a mid-week match ain’t too shabby, even if it seemed like they should’ve gotten more. I’ve seen Saër Sène put in some beautiful crosses, and even lead a few beautiful balls into the box for an onrushing Diego or Rowe. But his passes Saturday were pretty awful and I really don’t think that’s what we should be expecting the guy to do. And when did we go back to this “no taking shots” mentality? Chivas scored because of one moment of chaos with a few failed attempts to clear the ball from the Revs’ box. Revs had a number of those moments in Chivas’s box and they almost all ended with the ball being cleared instead of someone even TRYING a shot. At a certain point, you have to take a few speculative shots. Final thought: despite my continued desire for Jerry to find a home somewhere else, he had a few moments on Saturday that made it clear what he *could* do, if he were getting better service and trying harder himself. The offside goal was well-hit, if offside, and he almost nutmegged a kneeling Dan Kennedy before that. Still, the rest of the time, we were essentially playing with 10 men. No good. I saw the halftime piece featuring Nguyen and he said that his role this year has changed. He is having to fall back more than last year. And it shows watching him in games this season. Not sure if that’s Heaps strategy to have more of a possession oriented game? all good points … I would add 6) Bengston needs to go. This is a team that is making things happen through pressure and hustle. Jerry has neither. We’ve seen successful strikers “conserve their energy” before – Montero and Henry come to mind … but here’s the thing – those guys can disappear and then CHANGE THE GAME with one or two touches. Jerry avoids the latter and just disappears amid a cluster of half challenges and jogs. Just watch Agudelo … he’s working out there. Even Chad Barrett was a welcome respite from Jerry’s sleepy performance. He seems to feel that he only needs to try when someone plays the ball right to him. Sorry, good strikers also create their own chances, kid. They fight for balls, they force the defense to make mistakes. They don’t nap on the field. End rant. Nice review of the match as always Brian! I agree with all your points. With respect to Nguyen, I think it time to shift him back to a wide midfield role again. He was more effective there last year and I can’t help but believe that the middle of the pitch he seems to believe he can control things by trying to do too much himself. I’ve never been a Simms fan and would love to see Cisse get another shot with Caldwell taking Nguyen’s place in the middle and Sene shifting to the lone forward role. He hasn’t looked right on the wing since his return and with the absence of agudelo and bengston clearly not the answer it seems to me it is time to try starting Sene up top. Caldwell couldn’t play 2 matches in 4 days? Give me a break. He’s 22 years old. In other leagues guys will do that for 2 months straight. That said, this team is struggling with the same issue they had last season. No width. They have no attack from the outside backs and no true wing players on the roster (you could argue Fagundez I suppose). Teams will continue to pack it in and foul as we have no exceptionally dangerous set piece taker either. Heaps didn’t find a way to adjust last season, let’s see if he’s figured it out this year. is seem like he always doing great at beginning of the open season-and fade away at the end .